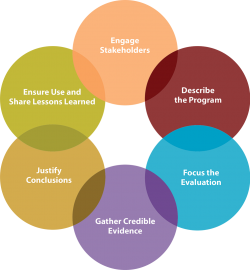 A self-paced, six-step e-learning course to help STD programs build capacity and conduct effective evaluation. Interested in doing your own program evaluation? Here’s some real world examples of STD programs that have done evaluations, including resources and lessons learned. 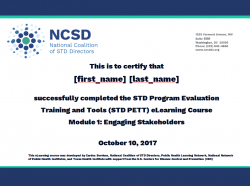 STD Program Evaluation Tools & Trainings (STD PETT) provides a six-step evaluation approach to help local, state, tribal, and territorial STD programs better understand where their efforts have been effective, and how to improve. Whether staff have a great deal of evaluation expertise or are considering an evaluation for the first time, STD PETT training modules help users re-envision existing activities as evaluation activities — using resources they may already have — to monitor and assess their impact. STD PETT’s creative and practical ideas put effective, thorough evaluation within reach. Each self-paced module should only take from 30 to 60 minutes to complete. For access to e-learning modules, see links below for each module. To access a set of tools and resources for program evaluation, click here. These tools and resources are also embedded within and can be accessed through the course modules. This brief introductory module provides an overview of the six module course, including the course goals and objectives. It describes CDC’s framework for program evaluation, which serves as the foundation of this course. This module establishes the important role stakeholders play in program evaluation, and guides users in identifying, engaging, and retaining key stakeholder groups. The accompanying checklist, tracker, and conversation guide provide a clear framework for briefing stakeholders and responding to their input. This module aids users in developing goals and SMART objectives based on a program needs assessment. To set up a successful evaluation, users can draw upon templates and examples provided to construct a logic model for their program. This module discusses ways to adapt evaluation plans to meet various program and stakeholder needs, assess resources available for evaluation activities, and construct meaningful evaluation questions. An Evaluation Questions Prioritization Tool is provided to assist users in focusing evaluations on questions of highest importance. This module reviews how to select reliable indicators aligned to evaluation questions, choose appropriate data sources, and establish clear data collection methods and procedures. Using the Evaluation Plan Template, users can compile selected strategies into a thorough plan of action. This module reviews simple, accessible data analysis tools and methods to help users make sense of their findings, and use those findings to tell the story of their program. Accompanying data analysis aids can be used for practice or adapted for full implementation in the field, and do not require advanced statistics. This module recommends strategies for disseminating evaluation findings, and communicating expected actions to be taken as a result of the evaluation. Several communication tools and a checklist are provided to support sharing lessons learned. A certificate of completion will be provided to persons completing each module and related evaluation survey. See the link within each module for survey and request for certificate. With any questions, please contact Charlie Rabins, NCSD, Capacity Building Consultant. This eLearning course was developed by Cardea Services, National Coalition of STD Directors, Public Health Learning Network, National Network of Public Health Institutes, and Texas Health Institute with support from the U.S. Centers for Disease Control and Prevention (CDC).